As Backer Build Three for Phoenix Point has now been released, work is well under way on new content for future builds. Thus far we have only shown Havens for one of the major factions, New Jericho. We now turn our attention to The Disciples of Anu - the cult-like followers of an ancient god of the same name. While the images we have to show at this stage are in the form of concept art, the infrastructure which has been put into place already in crafting the New Jericho Havens allows us to turn these concept drawings into fully textured 3D environments in a relatively short time. Unlike New Jericho who had the luxury of converting their old military bases into Havens, or using their experience and resources to construct new ones, The Disciples of Anu live by simpler means. The Disciples’ living areas within the Havens are essentially slums - with housing put together from whatever materials they can get their hands on. As the Disciples embrace the changes brought about by the Padoravirus, its mutated vegetation and tendrils are left to grow wild around their structures. The Disciples of Anu houses have a much more organic and chaotic appearance to them than the very clean-cut Brutalist designs of New Jericho. In an effort to save on materials in constructing their housing, The Disciples build many of their structures around trees and other natural formations. These provide additional protection and stability for buildings while reducing the resources required. The interiors of the slum housing is also very different from that of New Jericho and presents different tactical situations. Fewer large, open spaces and many smaller rooms connected on different elevations means a change in strategy. Those members within The Disciples of Anu who find themselves higher up in the hierarchy aren’t going to be slumming it with the rest of the population. The Anu elite will mostly be spending their time in the temples of Anu. The idea behind the layout concept for The Disciples of Anu temple districts allows for tactical combat on multiple levels, both indoor and out. Several large, ornate buildings, all interconnected by raised walkways, inner corridors are cloisters. The temples are much more ornate and intricately constructed than the general Anu housing. Only the finest construction materials are worthy for building a house to worship Anu. 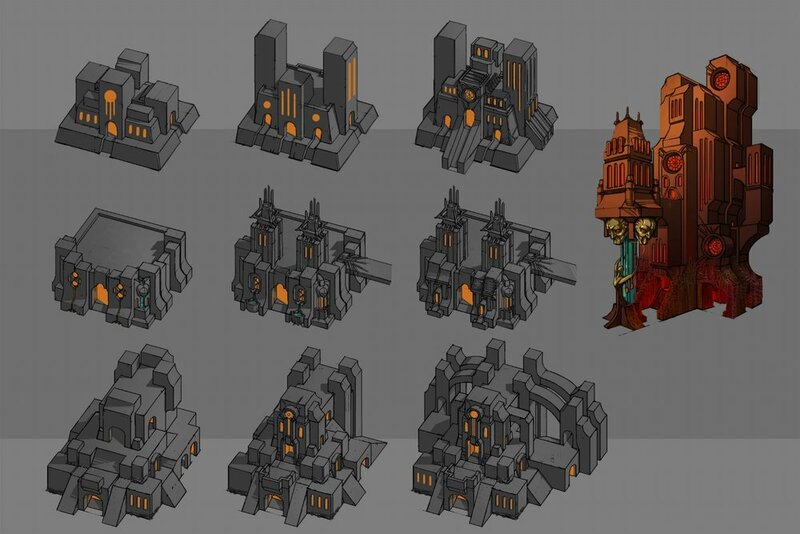 The above image shows a selection of different temple district buildings, starting with more humble and simplistic structures and eventually becoming sprawling temples to the old god. Many different styles, colours and different forms of iconography have been considered for The Disciples of Anu. The Anu Havens will have their own stylised props too. Those shown above are just a small selection in the early stages, but we will have more to share wit you later. A little bonus image from The Disciples of Anu training district where new soldiers are taught their combat skills. In addition to The Disciples of Anu Havens, the art team are also currently working on Phoenix Project bases and concepts for Synedrion. We will be sharing some of that in a future update.